First things first, the Atlanta treble is not a real thing but something I made up to capture a mini challenge I set for myself when in Atlanta over a weekend for work. The treble was an attempt to do 3 races in 3 days and by making it a challenge ensuring I got up on the sunday for the final race!!! 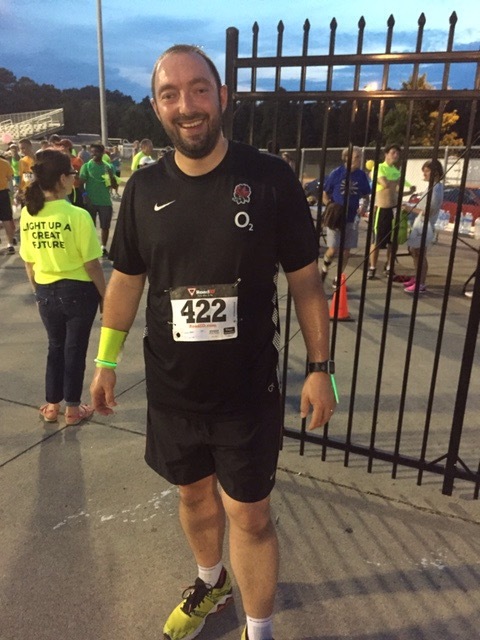 My first race was on the Friday evening in Woodstock for the Project Search Glow Run 5k. My team at work also came along for the ride and I think to see what the crazy English bloke was up to!!! After the inevitable wait for the start the race itself was a good if not chaotic event with the start more of a bundle but the route of two laps round the high school and then up and road and back was a good course if not a little brutal for a fun run! My first thought that the route had not been meticulously mapped out was when one lap was over 2.5k. It later transpired that a cone had been put in the wrong place so it added a km which was OK.
Good atmosphere, nice camarederie amongst the runners and a lot of swearing at the killer hill !!! 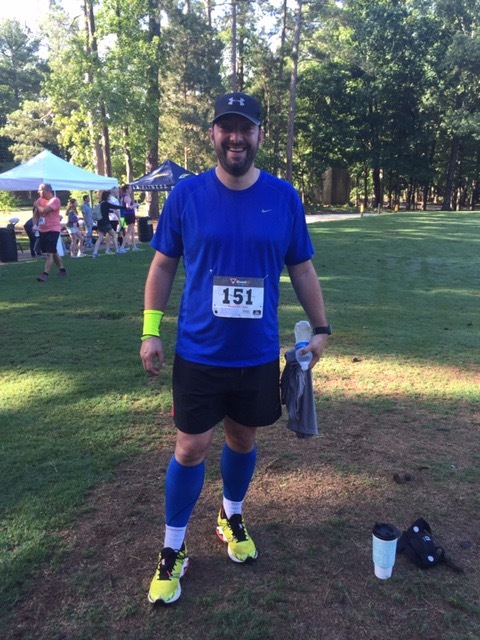 The one piece I really struggled with which did not bode well for the weekend of running was the heat. I really struggled to breathe and as a runner who sweats a lot anyway, I would have been less drenched jumping in a pool by the end! Massive shout out for my colleague who in her first race won her age group!!! 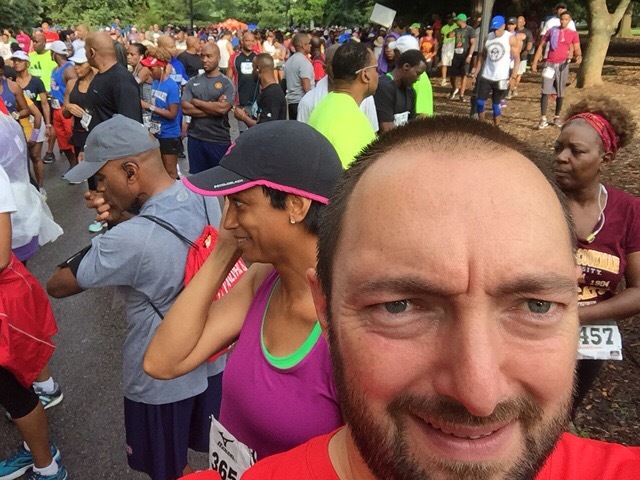 This race, around Piedmont park, was the HBCU 10k, which when I entered I didn’t realised was the Historic Black Colleges and Universities 10k, a fundraiser to send kids to college who may not normally be able to afford it. I’m not one for commenting on race/political issues and my feelings probably say more about me than anything else but there were approximately 3500 runners and I saw 2 other white people. With the events that had just happended in Charleston I felt a little uneasy but there were no incidents at all apart from a lot of funny looks. To be fair I attract that in day to day life anyway! As for the race… I think next year they need to give it some serious thought as the route was not very good at all. A 5k for runners and walkers and a 10k all at the same time all across sort of figure of 8 course with the volunteer marshalls a little confused and a finish straight full of people getting places. That aside, there was the normal level of great support and I really really struggled with the heat and don’t think I’ve ever sweated so much. But, I got round and was nowhere near the time I had hoped but at least I’d done it. This is where my challenge came it to its own. A hard run on the Friday with the hills and heat, a poor performance really on the Saturday and I would have happily stayed in bed. 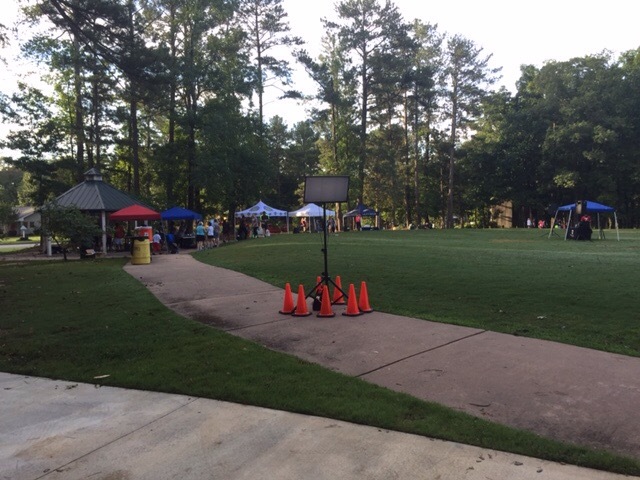 BUT I had told a few people about the challenge and forced myself out of bed and headed to Brook Run Park for the Tropical Smoothie Cafe 5k with no expectations! 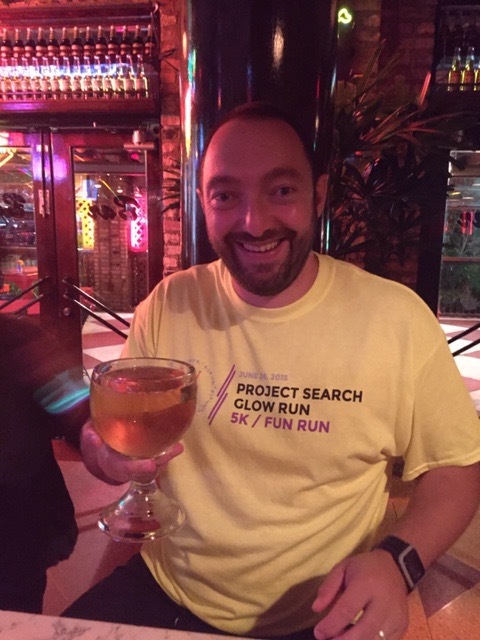 The run was just being set up when I arrived at 7am (for the 8am start) and the enthusiasm of the volunteers was great. The DJ (yes they are a must at all US runs it turns out) recognised me from the saturday night race and we had a nice chat about it and the course and then I just sat on a park bench waiting and semi sleeping! The race itself was lovely, about 200 people on a course out and back on a road then round a trail around the park. Obviously there were the hills, the heat and the humidity but managed to get through a hard patch after a couple of km (ridiculous really) and ran strongly to the finish to come in around my normal time despite the heat, hills etc. After the race there was a great relaxed, sunday morning vibe and people stayed around drinking the free smoothies, having the free massages and generally chatting and listening to the DJ !!! 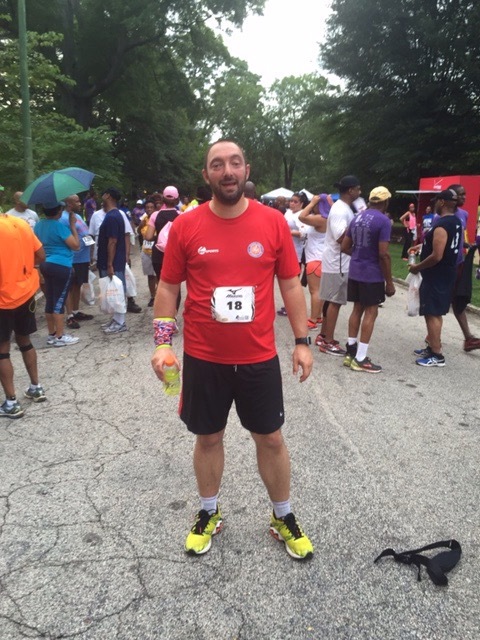 The Atlanta running club I think have their motto as “Hills, Heat and Humidity” and god their right ! The challenge was good fun and gave me a purpose for a weekend that I could have spent walking round a mall or just lazing round in the hotel. Plus I got to meet lots of people, explore new areas of Atlanta and push some of my boundaries. Way to go! The race swag looks really fun! Figure 8 courses, or any course where you need volunteers pointing the way are always bad news.